Ambulance drones to supply medicines. Thermal drones are for rescue purpose. In firefighting, UAVs have a great use because no personal losses are seen. DJI announced Matrice 100 which has newest tools enable us to revolutionize the world. This model of DJI is a flight platform and Guidance Vision System. Matrice 100 is a new modular quadcopter platform and is customizable in both hardware and software. This Quadcopter is far away from the entry-level DIY drone. M100 has a lightweight frame with slots and holes for mounting additional hardware. DJI has ready to carry any sensors and devices by which we can put the drone in the sky. DJI are redefining industries where there are professionals in filmmaking, agriculture, search, and rescue, conservation, energy infrastructure and lot more. The DJI M100 is one of the most advanced UAVs on the market today. This Matrice 100 is designed specifically for hacking. This UAV is capable of capturing commercial aerial photography and videos. By this DJI Matrice 100 Review, you can know more details about this product. The dual battery compartment allows our Quadcopter for the extended flight time upto 40 minutes with the lowest payload. Built-in GPS helps the Matrice 100 to perform various features like Follow Me, return to home, etc. We can easily operate complex tasks performed by the fully programmable system by which the pilot can focus on the footage and goal. Increase performance by improving the yaw torque adjustment to 3 angles. Installation of quick release landing pads helps for a soft landing and reduce impact. We can enjoy the real or live view by connecting the Quadcopter Matrice 100 to Android or iOS. Fully Automated Flight process called Guidance is Incorporated in DJI Matrice 100. The Ultrasonic and visual cameras in this model can sense and detect the obstacles in flight. We can feed data into a central processing board and export the data via DJI SDK by five sensing modules. We can add components, customize the payload, and fly with any devices we wish by the additional expansion bays. By this drone, we can gather data while completing multiple jobs from the bird’s point of view. By the hardware expansion bays, Matrice 100 can be configured to carry 1 kg. The Matrice 100 DJI is not a kit like most commercial offering drones. The company developed this product in such a way that it is ready to fly Drone. 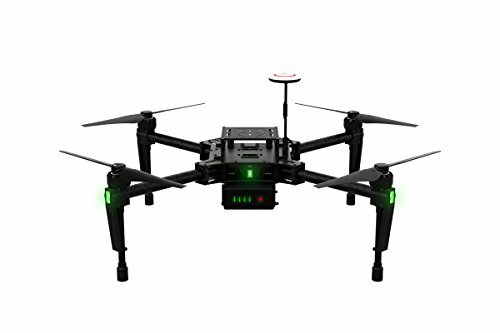 This Quadcopter is fully integrated operating platforms, complete with a flight controller, flexible cargo bays, GPS, and a rechargeable battery. DJI developed fully programmable with two new robust software development kits to customize their UAVs for commercial purposes. This SDK in DJI matrice 100 makes developers easy to build mobile apps for specific industries, tasks, and applications. Autopilot Phantom, Pix4D, Drone deploy are the three examples of custom mobile apps for M100. By using this API SDK, we can customize our drone to support any particular application or industry. We can create custom flight commands, Autopilot apps, Informatics and Avionics apps by API SDK. We observe High precision navigation in DJI Matrice 100 by using the vision and ultrasonic sensors. Stereo algorithms provide super-high precision positioning even when flying at high speeds and maintain indoor hover to within centimeters. DJI guidance scans the surrounding environment and detects all obstacles, i.e., in 360o. To avoid collisions and perform emergency maneuvers automatically by Guidance. DJI 100 Matrice has dual parallel CAN ports for connecting other DJI devices. It also offers dual UART ports for connecting third party add-ons. An additional battery compartment is added in DJI Matrice 100. Because of dual battery compartments, we can achieve up to 40 minutes of flight by a second onboard battery. The DJI M100 comes with a long range customizable remote controller with an operating range of 1.2 miles. DJI RC has a holder by which we can connect our mobile device and comes with a rechargeable battery by adjustable controls and video outputs. All apps run on our choice of smartphone or tablet. DJI M100 comes with Pilot app which provides video streaming, navigation, and information features out of the box. GPS in M100 DJI helps the drone to set path the drone should fly. The drone can fly to multiple points and returns on the same route. The DJI Matrice 100 is a rigid, stable system and has 50% fewer vibrations because of lightweight carbon fiber. Elimination of feedback from the powerful motors is done by the DJIs new soft vibration-absorbing material, and Critical components are kept stable and allow unprecedented accuracy. Installation and replacement of these landing pads give the DJI matrice 100 protective landing. They also protect our system and eliminate unintentional lifting off the ground. This Enhanced GPS helps to track our drone accurately in real time. Even in faster satellite acquisition, we can acquire an accurate position holding and flight planning. Matrice 100 is stable and responsive because of the new N1 flight controller and increase flight range to 1.2miles. This drone feature also helps us to transmit data to us and brings live HD view. The testing of this drone is performed in open areas so the range may vary on local regulations. Capabilities of Matrice 100 are beyond mobile apps by allowing UgCS. We can connect our M100 to our laptop with UgCS on it and can perform full-fledged desktop mission planning. An upgraded version of DJI E800 electric propulsion system powers your Matrice 100 and keeps it in flight. Four powerful, brushless motors and four lightning-fast Electronic Speed Controllers are integrated into the platform, giving you complete control during flight. With increased strength and payload capacity, you have the flexibility to create the system you need. This feature is performed when a GPS signal is strong. We set an object, building or a person as the target and let the drone fly by itself. To avoid any crash or damage to drone in low battery conditions we use this feature Return To Home. By this mode, our drone can return safely to home in low battery conditions. The DJI matrix 100 is perfect for vertical Drone providers. Ready To Fly UAV has highly integrated design. The sensor bays in this drone is vast and flexible. For any application, it is highly customizable. The DJI matrice 100 payload capacity is 1kg. Long flight time by dual battery compartments. Incorporates Fully automated flight process called guidance for obstacle sensing detection. Specific integration controls our camera gimbals directional view by just moving our head. DJI Matrice 100 is too expensive for consumer use. Purchase Camera, Gimbal, and vision sensor separately. Unauthorized access of the product should not be subjected. Unauthorized people should not perform disassembling, modification, or installation. Tampering of product labels, Serial numbers, waterproof mark, false mark, etc. show no signs. We should provide valid proof of purchase, receipt or order number. Within seven days of purchase you ould request for a refund. You can ask for the replacement when the purchase is about 15 days. Battery charger with AC cable. First of all, check the frame arms and center arm and then mount the frame arms. Successively we should install the battery and extra battery in the spare battery compartment. Install Expansion bays and GPS module in the next step. Now attach the propellers and if you want you can mount the gimbal which is optional. Before inserting Intelligent flight battery makes sure, all the parts installed. To avoid interface with the power board make sure to use extension rod to separate GPS module. Frame arms must be mounted correctly and use 3-degree fasteners. Do not remove glued in screws. Do not fly the drone in rainy or snowy weather because it is not water resistant. Ensure that all the parts are in good condition especially the cooling fan. Before each flight make sure all the cables, propellers and motors are correctly installed or not. During transportation disconnect the battery and remove the camera to avoid damage. Perfect for vertical Drone providers. Everything needed to get into the air including the high-end transmitter. What is the wireless range of M100? It is about 20-40 minutes. Matrice 100 carries the DJI legacy forward. M100 equipped with many advanced features and is the best pick of professionals, research developers, and corporates. Everyone could not afford it because this drone is expensive. By the DJI M100, we can let our ideas and dreams into reality because of its fully customizable and programmable flight platform. I truly believe that DJI Matrice 100 Review helped to know the details of this UAV.